At Bottom Line Solutions, we prioritize consulting with farm owners to determine the best precision ag farm equipment solution for each customer. When your equipment is not working properly we can be on site the same day to get you up and running. Whether, the issue is hardware or software related, we offer advanced experience and knowledge to remedy the problem the same day. One of the core benefits of using the service department at Bottom Line Solutions is that our service technicians have certifications for Precision Planting and AgLeader products to ensure we are prepared to help when you experience an unexpected breakdown. There are plenty of places to go for your precision ag needs, whether it’s broken or just in need of regular maintenance. There is a certain peace of mind that comes with knowing a certified professional will be the one doing the work on expensive equipment. Not all service has to be in response to something that has gone wrong. Just like cars and pickups require an occasional oil change and tire rotation, precision ag farm equipment also needs to have regular maintenance done to ensure everything operates as it should throughout the planting and harvesting season. We offer certified technicians that will take care of routine maintenance for your equipment. Routine maintenance on your precision ag components decreases the chance of an unexpected breakdown during the peak of harvest and planting. 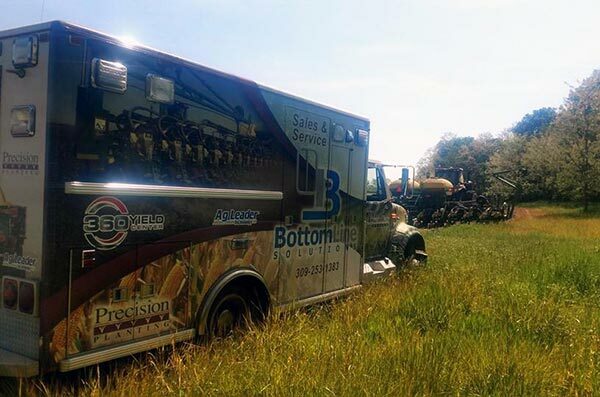 If you ever have a question about the regular service schedule for your precision ag components, just call Bottom Line Solutions, and we’ll be happy to help you schedule service that might be necessary. In the event precision ag equipment is not performing properly and replacement parts are necessary to get you up and running, we have certified parts to ensure a quality repair. Certified parts manufactured by Precision Planting and AgLeader are built by the same manufacturers that built the original farm equipment, using genuine parts in the replacement process maintains the integrity of the planter, tractor, or other farm implement. Our service technicians at Bottom Line Solutions can be on-site for farm repairs, we understand how detrimental down equipment can be for any farm operation and we are here to help. Our process; our technicians begin the process by walking through potential issues over the phone and then make an in-field service call if necessary to fix your farm equipment on site. This type of convenience lets our customers know that any sort of precision ag farm equipment repair, literally is just a phone call away. There are not many instances in which precision ag farm equipment repair is a convenient thing for those working in the fields during a planting or harvesting season, but the service department here at Bottom Line Solutions can remove as many of the headaches as possible. 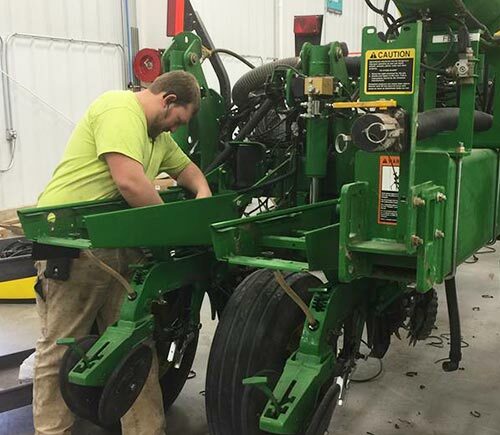 If your precision ag equipment needs regular maintenance or more serious repairs, give us a call any time so our service department can get your equipment back up and running and as good as new. Save our service number for easy access when the unexpected occurs: (309) 253-1383.